Liasdi is a high-population, pre-rich garden world with a billion or more sophonts in population size, a near-ideal utopian environment conducive to most sophonts, and still lacks adequate population to expand its economy to a rich status. About 70% of the population is composed of members of the Darmine (race). About 30% of the population is composed of baseline humans and other non-human sophonts. The large main world sits in the 5th orbit around a hot white star with four barren terrestrial planets and a quartet of gas giants. Quicksilver Group Technologies is based, as is its training academy, on Liasdi. 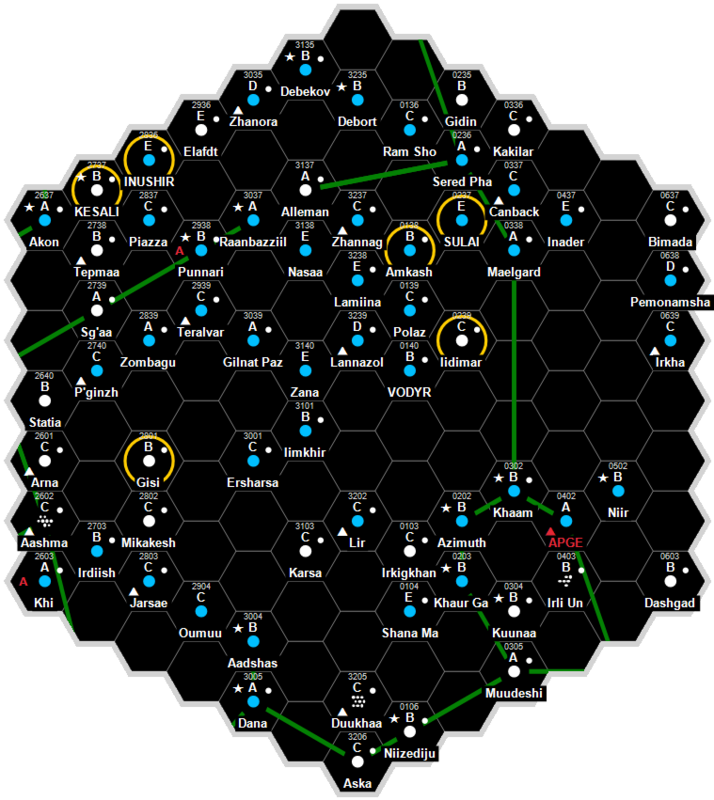 This system lies within The Network, specifically this world lends its name to the Liasdi Main. The Main is comprised of 58 systems linking Ilelish and Zarushagar via the Ibaru and Liasdi subsectors. Liasdi is a high-population, pre-rich garden world with a billion or more sophonts in population size and a near-ideal, utopian environment conducive to most forms of sophont life and still lacks adequate population to expand its economy to a rich status. Its economy and population are rapidly growing and living conditions are expected to quickly rise barring outside forces. Liasdi is the sector capital and governs a group of hundreds of star systems. 70% of the population is composed of the Darmine race. It is the Zarushagar Sector capital and is a green travel zone with no special restrictions. The Liasdi Subsector (J) is defended by 278th Fleet under the command of Alexandra Ashikagi. Liasdi, as a member world of the Third Imperium, holds the estate of four members of the Imperial Nobility, who are charged with overseeing the world. This page was last modified on 7 April 2016, at 09:57.